Ash Hemmings has been challenged by AFC Fylde manager Dave Challinor to take full advantage of his opportunity in the team after the winger netted his first goals for the club. 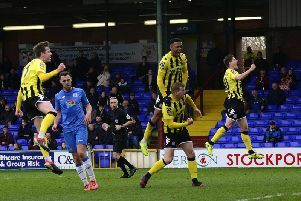 The forward’s brace in Saturday’s 2-0 win over Wrexham saw Hemmings break his duck after 19 appearances, having signed from Salford City last summer. The 27-year-old has struggled for regular game-time and was loaned to Altrincham last month only to be recalled early on New Year’s Eve. Challinor said:“Ash has had to be patient and wait for his chance, and we got him out on loan to get him some games. “He’s obviously come back in and he’s looked really sharp in training. “I thought he looked a little bit nervous early on but he’s got himself two goals, which will do his confidence the world of good. “He’s now got an opportunity and he’s got to go and grab it, which is the case for everyone who is put in the team. “It’s about taking their chances and making my job easier by making their name one of the first on the teamsheet. Challinor also praised the impact of Fylde’s debutants, midfielder Dan Bradley and defender Timi Odusina, both handed starts days after signing. “I felt they were fantastic,” he added. “As Timi is a young lad, probably the most impressive thing was how you didn’t notice too much about him. He was very inconspicuous about what he did. “He did everything really comfortably and never looked under pressure. He did a job really, really well and was fantastic. He’ll only get better. “Bradders does what Bradders does. I thought he was a real threat and got in some great areas. That game will do him the world of good. “When he came back from Kidderminster, and I spoke to him about the intensity we train at and the intensity of games in the National League. “Even though it’s only one division up from the level he was playing at, he’s not been part of that. “That’s his first 90 minutes for a bit of time and he’ll feel it. I’d imagine his stats are unbelievably high but he kept going and did a great job for us. He will only get better.